So many options, and such beautiful berries!! I felt the pressure. 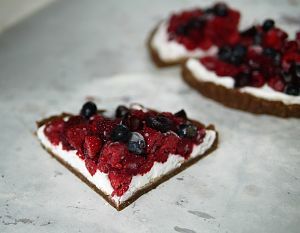 I went with Rawsome Vegan’s Jewel Fruit Tart because it didn’t require any nut-soaking and seemed like one of those desserts that was totally suitable for breakfast (eg. lots of nuts, unrefined sugars). In the end, I realized I had totally altered the recipe. Here’s the adapted version. Thanks for the amazing inspiration as always, Emily! 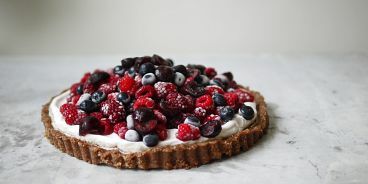 Prepare your 8-9″ tart dish: rub with coconut oil and cut-out a circular piece of parchment paper to lay on the base. Next, cut three long, 3″-thick strips of parchment — lay these in your tart dish before you add the crust. They will act as ‘easy removal levers’ when your tart’s all done. In a food processor, grind almonds into a flour (if you prefer little chunks in your crust, you don’t have to grind so fine). Now, add your dates and salt until a dough ball forms. 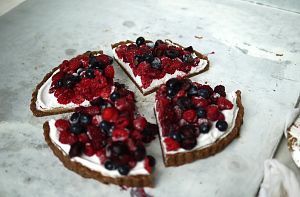 Using your hands, press dough into your tart dish to form your crust. When done, place in freezer to chill while you work on the filling. Add nut butter, coconut oil, maple syrup and salt to your blender and puree until smooth (if you don’t have a blender, this step can be done by hand using a whisk or maybe even a fork). Remove tart from freezer and pour in almond butter mixture. Spread it around so the entire tart base is covered. Place this in the fridge. Remove coconut cream can from fridge, flip upside down and open. Remove watery portion and scoop hardened cream into the bowl of your mixmaster. Whip until light and fluffy (about one minute). If you’re a real sweet-tooth you could add some sweetener here, but I don’t think it needs it. Remove tart from fridge and dump on your coconut whip. Using a spatula, spread it out into one even layer. Next, add berries. 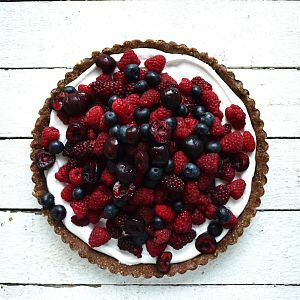 For an aesthetic touch, you could add a sprinkle of icing sugar to the berries. Enjoy at room temp or frozen! 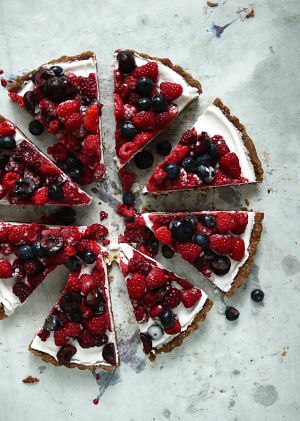 All images were shot when the tart was frozen (except #2). Where I got my BC berries: cherries – spud.ca, blueberries – available at most supermarkets, tayberries and raspberries – Emma Lea Farms, from a sweet + generous friend.